The true "Cabin on the Lake" experience, with infinite options for families and groups of all sizes. The property has its own dock on Spoon Lake, with gently sloping access for swimming, sunbathing, canoeing, or kayaking (our lake is motorless to protect the loons, making it quiet and safe.) There is easy access to incredible mountain biking and hiking just steps from the front door. Glacier National Park, West Glacier town, and access to the North Fork of the Flathead River are within about 10 minutes. World class skiing and the resort town of Whitefish is only 20 minutes away. Either rent the main 4 bedroom, 2 bath cabin on its own, or bring more people and add anything from one to four extra 1 bedroom/1 bathroom cabins on the same property. The guest cabins are never rented to a separate party from the main house, so your privacy is assured. The main cabin has an inviting Great Room for gathering, with a gas stove, two large couches, and plenty of seating and tables, as well as a TV for movies. This room also has a very long wooden dining table with long benches to accommodate up to 20 people comfortably for meals and games after supper. The Great Room also opens to a large wraparound covered deck with plenty of seating available to watch the loons on the lake. Each of the additional cabins sleeps two people and comes with two twin beds that can be converted to king size. Each cabin has its own 3/4 bathroom with shower. Two of the cabins also have microwaves and small fridges. In each cabin, you can look out at the peaceful lake when you wake up each morning. 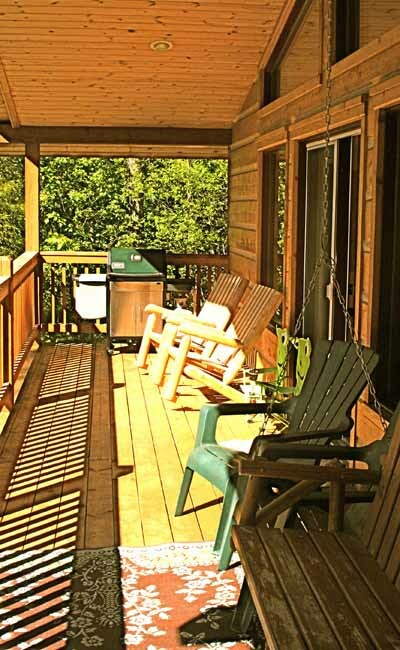 The main cabin has a fully equipped kitchen and a Weber gas grill on the covered deck. All bedding, quilts, linens, and towels are provided. Just imagine how much fun you can all have hanging out together at this truly remarkable mountain lake property. Civilization is only 8 miles away with antique shops, a great coffee shop, and a family barbeque spot in Columbia Falls. High end shopping and dining are only 20 minutes away in Whitefish. You can fly into Glacier International Airport and arrive at your mountain lake getaway in 20 minutes. Missoula International Airport is only 2 hours and 15 minutes away and Spokane WA is only 4 1/2 hours away.